On December 5, 1937, Founding parishioners gathered at a banquet with this Eminence Archbishop Antony Bashir to express their desire for a church in San Francisco. It was from this very enthusiastic gathering that plans for a church emerged. St. Nicholas parishioner, Elias Habeeb later recalled how his mother saw a building for sale at the corner of Gough and Green Sts. and told other leaders in the community about it. Eight months after the banquet the building was purchased and remodeled to meet Orthodox requirements. The Ladies’ Aid Society was formed and became the most vital arm of the Church. Led by Rose Naify, other members included Genevieve Naify, Victoria Habeeb, and Sadie Habeeb. The first Board of Directors: President, Nick Sahati ; Vice President, Shaded Romley; Treasurer, Fred Salih; and Secretary Dr. Carl Rayes. The Directors were: Aziz Anthony, Charles Anthony, Toufic Aswad, Fred Ayoob, Issa Badran, Tanios G. Habeeb, Elias Jeha, George Naify, James A. Naify, Mitry Ofeish, S.G. Sadallah and Dr. Simon Zachariah. September, 1938 the church was incorporated and the following year its first full time priest, Father Brahim Corey served his first Liturgy. Within the next two years the pledge system was instituted, the first Sunday school class was held and the church was consecrated. 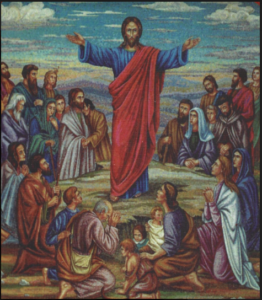 In 1944, Father Michael Khallouf became the second pastor. During his pastorate, the end of World War II was celebrated with a special liturgy of Thanksgiving. In 1947, plans for a larger church began. In 1951, the first youth group was formed. A building fund was established when a founding member bequeathed $5,000 toward the building of a new church. October 1, 1952, Father Elias Karim became the Church’s third priest. He served until 1964. During that time there were many firsts: The first choir was formed; the first junior youth group was formed; the Ladies Junior Auxiliary was established. In 1957, the church hosted its first Western Region SOYO Convention. The Men’s Fellowship was formed. corner Diamond Heights and Duncan. The Agency left the decision up to the churches to pick the winner —- out of a hat. In a most dramatic moment, the President of the Board of Trustees picked the winning number. The lot bought previously was sold in favor of the Diamond Heights location. 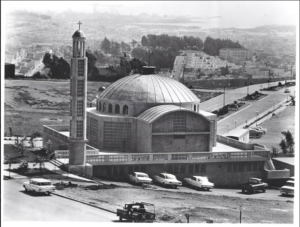 Ground breaking ceremonies, with Archbishop Antony presiding, along with Building Chairman, Joey Ayoub, was held in 1962 and construction on the new church began. The first mission in the Bay Area was Church of the Redeemer in Los Altos in 1963. Before that time, St. Nicholas Parish extended from Sacramento to Santa Cruz, and the East Bay. Later that year the first Cadillac drawing was held.On May 10, 1964, Father Gregory Ofiesh became the Church’s fourth pastor and celebrated his first liturgy here on Mother’s Day. He immediately directed his efforts toward the completion of the construction of the new church building. The East Bay Auxiliary was formed. The old church and parish house were sold. In April 1965, the church was dedicated, Archbishop Bashir presiding. Ten months later Archbishop Bashir entered eternal life. In March, 1966, Father Philip Saliba was elected as new Archbishop and served his first Hierarchical Divine Liturgy in August at the Archdiocese Convention here in San Francisco. The year 1968 saw our first Archbishop’s Cotillion and our first camp program at St. Sava Camp in Jackson, CA. Our young men participated in the Orthodox Basketball Association for the first time winning the Church’s first championship. We honored the Mother of the Year and the by-laws were revised. In 1973, we burned the mortgage of the church. The seventies also welcomed Father John Ocana as our first assistant pastor and Father Gregory celebrated ten years as our Pastor. In 1976 we hosted our second Archdiocese Convention, a week-long event that was remembered throughout the Archdiocese for many years to come. The Northern California Deanery was established and plans for an educational center began. 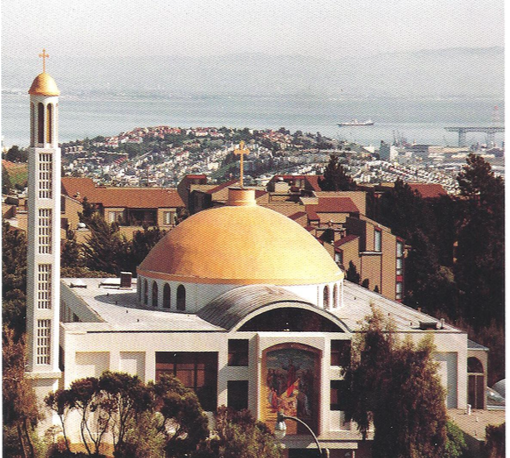 St. John the Evangelist was established as a new mission in the East Bay. Issa Dib was ordained to the Diaconate. We can never forget our production of the Broadway musical, the “King and I” in 1977! The Educational Center was dedicated in 1980 and an elementary school with a day care center was opened. The eighties saw the first woman chair of the Parish Council. The mortgage for the Educational Center was burned and plans for church expansion were initiated. The 50th Anniversary of the church was celebrated. In 1990, restoration and expansion of the church began. Metropolitan PHILIP dedicated the newly expanded church in 1992. The Archbishop’s Cotillion featured 15 young ladies in 1993. Bishop JOSEPH was permanently assigned to the Western Diocesan Center. 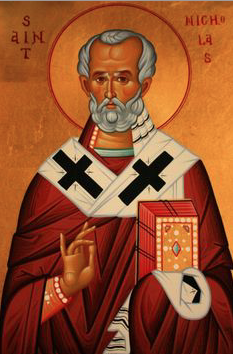 Father Paul Baba joined St. Nicholas. Father Nicholas Habib joined Father Gregory and Haytham Borzghol became the new youth director. Father John Salem was welcomed as Associate Pastor. They all went on to successfully serve other parishes. There were dinner dances, Middle Eastern Festivals, but the highlight of the nineties was the visit of His Beatitude IGNATIUS IV, Patriarch of Antioch and all the East. In January, 2000 the mortgage taken out on the expansion of the church was burned – the church was debt free. Father Gregory announced his retirement in 2000 and a banquet was held in his honor on December 2. In January, 2001, Father Nicholas Borzghol became the pastor and served until 2012. During that time, we saw the tedious restoration of the outdoor icon of the Sermon on the Mount by a group of dedicated volunteers. Church organizations: Men’s Fellowship, Ladies Auxiliary, Teen SOYO continued to thrive. Teen SOYO participated in Parish Life Conferences: Bible Bowl, Oratorical Contests. We succeeded in our bid for the Parish life Conference in 2014. Our basketball team was active in OYAA (Orthodox Youth Athletic Association) and won a championship. Father George Baalbaki was appointed as Pastor in 2012. Shortly after his arrival, Father George, chatting with Father Gregory, realized that the church would be celebrating its 75th Anniversary in 2013 and thus the idea for this celebration was born. A chairman was appointed, committees were formed, and plans were underway for a three day celebration October 25, 26, and 27, 2013. Simultaneously a committee for the 2014 Parish Life Conference was appointed and plans were started. There have been many challenges throughout the past 75 years, but the faith and determination of all who have served brings us to this celebration. To each and every one : clergy, choir, St. Ignatius, Parish Council, Men’s Fellowship, Ladies Auxiliary, Ladies Aid, Altar Guild, East Bay Ladies, SOYO and Teen SOYO, St. John the Divine, Sunday School teacher or student, faithful supporter of St. Nicholas, we say thank you – you are an important part of the mosaic that makes up St. Nicholas Church. Our church was built on faith and it is this faith of our fathers that will continue to inspire us in the future.